By the title alone, you knew Six Days in Fallujah, Konami's planned "documentary-style" combat game about Iraq, would create an uproar. Unlike historical or generic conflict, this covers recent and real, about a polarizing war. It's only a concept and screenshots at this stage, but Six Days in Fallujah already has promulgated opinions that the game caters to a cavalier pro-war attitude, or can be used as antiwar propaganda. The subject matter concerns Operation Phantom Fury of November 2004, an operation described as the heaviest urban combat U.S. troops had faced since Vietnam. More than 100 U.S. and allied Iraqi fighters were killed, another 500 were wounded. G4TV went to three members of the U.S. military on active duty, at least one having done three tours in Iraq. They were all described as interested gamers. Here are some of the reactions they gave to G4TV. Sgt. Kevin Smith, U.S. Army: "Let it be made, and hopefully it will bolster support for military veterans by giving civilians insight into what this war was actually like for them. ... You can't just lob a frag down the street or launch a RPG at a couple of guys if you have to reload. There are restrictions on what types of weapons you can use and when. 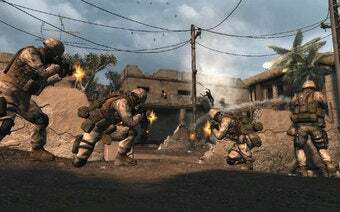 Depending on what the Rules of Engagement were for the Marines in Fallujah, and if Atomic Games has consequences for violating them, I think some gamers might find it a little frustrating." Gunnery Sgt. John Mundy, U.S. Marine Corps: "You will have your group of idiots that try to be the terrorists and kill Americans and shout obscenities through the TV, damning American military personnel. But hey, those individuals can make fools of themselves all because of the protection that we military people give them each day. ... If someone doesn't agree with the game, they can spend their money elsewhere." Sgt. Casey J. McGeorge, U.S. Army: "As a combat veteran and as a gamer, I have no problem whatsoever with the game...As long as it's made as realistically as possibly, I believe that this could be a good thing for both combat veterans and for the war in general." Mundy's comments are particularly striking. As he and all of us are no doubt aware, online gaming can be a carnival of unlimited, deliberate tastelessness. Six Days in Fallujah would provide those worms with some ripe fruit, indeed. It's not to say the game shouldn't be made, but I still come back to a feeling I haven't been able to shake about World War II sims - I know people who were in the real thing, and it wasn't entertainment for them.